Denying the Holocaust: The Growing Assault on Truth and Memory is the latest book by scholar Deborah Lipstadt, and the fallout from that book was her topic for Skidmore�s inaugural Balmuth Lecture in February. 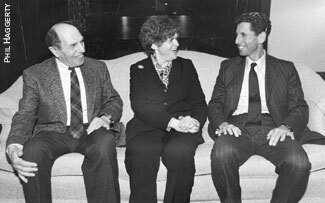 Professor Dan Balmuth, guest speaker Deborah Lipstadt, and lectureship donor David Moses �84 talk over the inaugural Balmuth Lecture. The Dorot Professor of Modern Jewish and Holocaust Studies at Emory University, Lipstadt served as a consultant to the Holocaust Memorial Museum in Washington, D.C. In 1994 she was appointed by President Clinton to the United States Holocaust Memorial Council, and in 1996 she was named to the State Department�s Advisory Committee on Religious Freedom Abroad. In 1986 she wrote Beyond Belief: The American Press and the Coming of the Holocaust. She holds an M.A. and Ph.D. from Brandeis University. Lipstadt was recently in the spotlight for winning a libel suit brought against her by British writer David Irving. In Denying the Holocaust, Lipstadt criticized Irving�s writings on World War II history, declaring him �one of the most dangerous spokespersons for Holocaust denial,� and he had sued her for damaging his reputation as a historian. But in April 2000, the court vindicated Lipstadt, concluding that Irving was an anti-Semite and �an active Holocaust denier� who had deliberately distorted historical evidence. Lipstadt�s victory was hailed by Jewish rights groups, historians, and even Israeli Prime Minister Ehud Barak. Lipstadt intrigued the Skidmore audience by describing the five years she devoted to fighting the libel charge, the work of her �dream team� of historians who combed through Irving�s writings and footnotes to make the case against him, and the triumph of winning a judgment that effectively expelled him from the community of reputable historians. She ended her remarks by reading a few of the outpouring of thank-you messages she has received from Holocaust survivors and their families. The new Balmuth Lectures at Skidmore are supported by the Daniel Balmuth Fund for Jewish Studies, established with an endowment of $50,000 from David Moses �84, a prize-winning government-history major who is currently an international banker with the Import/Export Bank of Japan in Washington, D.C. The fund honors Skidmore professor of history Dan Balmuth, who retired in 1998.